The Mint of Japan have announced their latest prefecture silver coin which features a well-known landmark or structure as its obverse design. This coin features the Kintaikyo Bridge, in the prefecture of Yamaguchi which is a historical wooden structure that consists of a series of five wooden arches and spans the Nishiki River in Iwakuni City. Built in 1673 by Kikkawa Hiroyoshi, the third lord of the Iwakuni domain, this bridge is known as one of the three most beautiful or unique bridges in Japan and was designated as a place of scenic beauty by the national government. 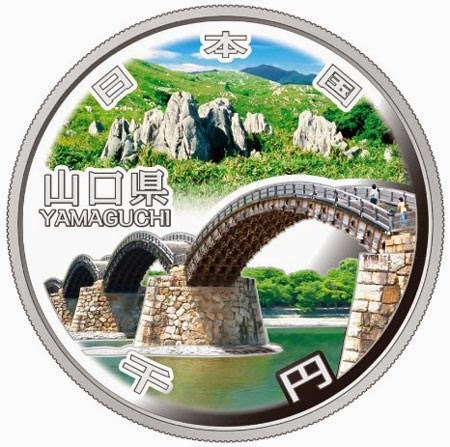 The obverse design includes a depiction of the Kintaikyo Bridge and the Akiyoshidai Plateau, which is the largest area of karst topography in Japan, located almost at the center of Yamaguchi Prefecture, and designated as a Quasi-National Park and a Special Natural Monument. 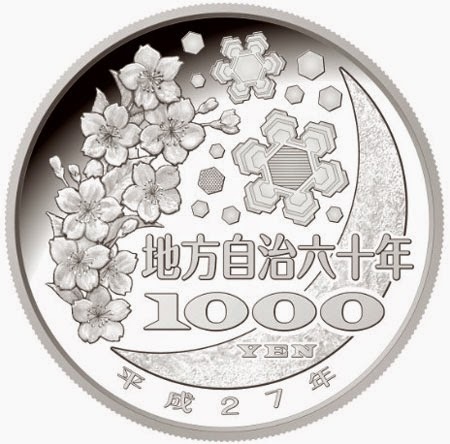 The common reverse design of 1000 yen silver coin: Snow crystals, moon and cherry blossoms. Latent image technology is applied to the center of the largest snow crystal to show the numerals of “47” representing the number of prefectures in Japan, and “60” representing the 60th Anniversary of Enforcement of the Local Autonomy Law appear alternately when viewed from different angles. The coin, which is the 39th consecutive issue within the series, will be available to order from now until the 30th June when the coin will officially be issued. A 500 Yen bi-metallic coin intended for circulation with the same design though not colorized is also to be issued at the same instance as the silver coin.